Note: Before beginning, teachers are reminded to read Loyal Creatures. The book contains descriptions of war and the teacher should decide about the use of this book in relation to the students in the class. Some may find the content disturbing. The following introduction is for the teacher. You may decide to share this with your students or you may prefer students discover the twists and turns as the story unfolds. Loyal Creatures is a World War I story that centres on Frank, a 15-year-old boy from country New South Wales, and his horse named Daisy. In 1914, the year the book is set, Australia still hadn’t introduced conscription; to go to war you had to volunteer and be at least 16 years of age. In many communities there was pressure on men and boys to sign up and fight for their country. To avoid war was seen as an act of cowardice, and often comments and insults were made to those men who did not sign up. Frank’s father, a water diviner, is against going to war because of a promise he made to his late wife, Frank’s mother. On page 18, Frank’s father receives a package containing a white feather, a symbol of cowardice. It is this type of pressure, and a feeling of importance and urgency, that convinces Frank to lie about his age and sign up for The Australian Light Horse Brigade. In response, his father breaks his promise to his deceased wife and signs up too. This book is Frank’s story and his involvement in the war as it was in Egypt and Palestine; however there is also a strong focus on relationships between men and their horses, between each other and in Frank’s case his relationship with his father and his deceased mother. Introduce the book by having students view the front cover and discuss the image (a horse in front of clouds) and font size of the text. What does this make you think of? Note how the word ‘loyal’ is a larger font size than ‘creatures’. Who might Gleitzman be referring to as a loyal creature? Next look at the back cover and discuss the image. Read the blurb carefully noting the punctuation, layout, simple sentences, question and dialogue. Ensure students can see the text. Briefly discuss the way this is written, do a quick think-pair-share and explain you will return to this later. Have a discussion about what the students know about horses. Record their knowledge to refer to later in the unit. To begin discussions about WWI, locate any war memorials around your town/area. It may be helpful to go to the RSL Virtual War Memorial. Use the ‘memorials’ horizontal menu bar then type in your location where it says ‘Search by place’. The map will show any memorials nearby. Do you know which wars have affected your community? Are there any members of your community who had a family member in The Australian Light Horse Brigade in WWI? Some students may be interested in consulting their local library for assistance or the local council to explore the community war records. Invite students to share any family history and personal connection to someone who has fought in a war. Now read the text aloud over several days. Make sure students can see the map that is on the front and back inside covers. They can ‘track’ the locations as they read or listen. Some students may choose to read independently. As you and your students read through the text, consider Morris Gleitzman’s connection to the text and purpose for writing it. Read the Author’s Note on page 157 where he explains ‘the story is based on history, but it isn’t a history book.’ Discuss the information shared here by the author, particularly how he came to write the book. Why do we write about the past? Why is a diary a good way of telling the past? Some of the reasons are that it is individual (history is told from a range of perspectives) and it is intimate and draws a reader into a character’s personal experience and feelings as if they are there too. A diary makes it personal which in turn makes it relevant because readers can connect the experiences to similar feelings in their own life. In Loyal Creatures, the events of the story happen quickly – this might be because Gleitzman has used the story structure to recreate the feelings and fast-paced reality of a battle. It might also be because sometimes difficult topics are better told in short bursts, particularly war stories. It may help to prevent the topic from becoming too overwhelming. Ask the students if they have ever gone for a long bush walk. What did they need to take with them? Answers like food, water and clothing are relevant. Ask the students if they’ve ever been to a desert or very dry climate. Discuss what it was like to live/visit there. Have brief look at where Egypt is on the map and invite students to infer the climate. After this discussion make a list with the students of what they think would be important to take to the desert in Egypt. Display this list as you continue to read through the book and refer to it as you discover what was important for Frank and his fellow soldiers. Why do we write about the past? Why are many books for young readers about the past told in a diary format? The Australian Stories Series provide an example. Have students draw on their learning about how their community was affected by WWI, discussions about diaries being personal and their own experience. Invite students to write one to two paragraphs in the form of an information text on why writing the past in a diary format might be an effective way to tell war stories from 100 years ago to children today. Remind your students that 2018 marked 100 years since the First World War Armistice. Acknowledging that date resulted in a lot of information becoming available as cities, towns and individuals worked towards acknowledging those who fought in WWI. Explore the ANZAC centenary website together. If after the discussion students still have questions, record them and display to refer to throughout the unit. Begin by having students form groups to do some quick research about key aspects of the book. Understanding these topics will help to deepen understanding. WWI Centenary is a BTN report that explains the general nature of Australian soldiers’ experiences in WWI and refers to underage soldiers (like Frank). There are also links to other BTN reports that may be of interest. The group might watch the video and decide on a few key points. The BTN report covers aspects of the war but not the Light Horse Regiment which Frank, his father and their horses were part of. The group can read about the regiment and decide on a few points to report back. Some parts of the world where Frank found himself will be unfamiliar to students, and these will have changed in the last 100 years. Suggest this group use a world map or Google maps to investigate where the countries mentioned in the text are, for example Turkey (Dardanelles), Palestine and Egypt. Use an Australian atlas to locate the area where the Cudgegong, NSW area was located. Suggest the group members consider what they find out about Egypt in relation to Frank’s first impressions when he arrived in Egypt (starting on page 40), imagining what the scenes he was greeted with would have meant to a boy from the Australian bush. Bringing together the information found by the four groups, invite some discussion around the bravery of animals and loyalty to their owners and the loyalty of owners to their animals. Explore these relationships by identifying some language features that signal relationships and/or identifying sentences in the book where these relationships are built. As students reflect on the text have them note any particular events of loyalty, or references to loyalty, between Frank and Daisy or Frank’s Dad and Jimmy. Early in the book Jimmy is injured and is declared unfit for service. This was a blow to Frank and his Dad. Dad took Jimmy to the railway station. Used all the money the army paid him for Daisy. Sent Jimmy up to a mate’s property near Walgett. That’s the sort of bloke Dad was. If a horse does the right thing by you, he reckoned, you do the right thing by them. Spend a few minutes analysing the layout and sentence structures used, particularly the simple sentences. Prompt students to think about their reaction as a reader. Ask students to recall other instances of loyalty between owner and horse and horse and owner. Display the words from the book that appear on the page before the text begins. As stated in the book this is the inscription on a memorial in Sydney’s Botanic Gardens dedicated to the Australian horses in World War One. Give students some time in small groups to discuss this, both the sentiment and the form of the inscription. Ask some questions to guide students to understand that Loyal Creatures, while fiction, depicts the typical relationships these men had with their horses and how they were valued. Record anything students are wondering about. Daisy is an important character in this book for many reasons. She is a loyal friend to Frank but we learn early on about some of her other attributes. Make a list of what students know about her character, linking back to the text. As an example, refer to page 9 where it says, Daisy, ‘got restless when water was close’. This skill was important in the work Frank and his father did in the Cudgegong district. Ask students to recall other times when this skill was important. Remind students they are making connections within the text to build comprehension. Then we reached town and saw the hearse outside the pub. Two coffins, An army hat on each one. This event told in a few lines (note sentence structure and text layout), triggered a major event in the storyline. Understanding the gravity of the situation requires inference. Give students time to think about this as an event in itself. This was a small country town with a small population and men and boys were being killed and the war had just begun. Consider the events on page 51 when Frank says goodbye to his father. Connect this statement to what came before in terms of the boy and his father and later in the book when Frank learns of his father’s death on page 53. I thought about Dad. What he’d done. Saved me from being a foot-slogger in the Dardanelles. How he’d never stopped looking out for me, ever. Not even when his heart was broken. Take some time now to consider the plot. In pairs, invite students to identify the moments where the tension is increased. Plot the journey for Frank and Daisy on the Hero’s Journey worksheet (PDF 118KB). Identify the moments where the risk and tension are increased. A white feather is sent anonymously to the house. Frank is deployed into the Water Deployment part of the military. Frank’s Dad is sent to the Dardanelles. It is the last time they see each other. Otten is killed on the battlefield. Compare and contrast the lists. Return to the words on the inscription beneath the memorial to the horses. Guide students to look carefully at the wording and punctuation. Point out that typically such statements are very few words but still have a structure. Work with students to deconstruct the structure so they can use this as a model to create a new text. The text created could be multimodal, that is, students might use an App to make a visual image of the memorial. Using what they have identified as a model, invite students to think about Frank and his relationship with his horse Daisy. Invite them to imagine there is a memorial for Daisy in the town she and Frank came from. What words would Frank write in the inscription? Individually or in pairs invite students to construct the inscription. Loyal Creatures is written as a first-person, present tense narrative. There are parts that are like a diary of events, written as they are happening. Ask students to consider why Gleitzman chose this method of storytelling, as opposed to a third-person narrative. A drama activity is a useful way to explore this. Have two students come to the front of the class. One student is to act out a simple task: brushing their hair, climbing a tree, etc. The other student is to verbally explain what the student is doing as it is happening as if they are the other student – I am doing this… etc. Have them do this for about 30 seconds. It is important to initially choose a student who is verbally expressive and confident to set the tone of the activity. When they are done, have another student explain what the student acting had been doing as if they are recounting an event they saw. Draw students’ attention to the use of present and past tense in each explanation. Now conduct the activity again but choose an activity that is more dramatic, such as falling off a bike, running a race and winning, etc. Have a student describe the action as it is happening, and another describe what happened after the event. Discuss again the use of pronouns and tense. Which is more interesting to listen to? Which method of telling gives the listener more interest and intrigue? Which method does the listener want to invest themselves in more? Revisit the concept that explanations of war and history may be told from a range of perspectives. This book is told from Frank’s perspective as he experienced it. It is about the relationship between Frank and Daisy, and the other soldiers he befriends in the Australian Light Horse Brigade and their horses. In order to invest in the story we need to know Frank’s thoughts and feelings. Told in third person this may not be as intimate a story. Consider the use of an image and the beginning of each chapter. There were badges issued honouring the Australian Commonwealth Horses. Some students may like to research this further. This image is consistent throughout the chapters as is the small image of a rifle between some paragraphs. Have a short whole-class discussion of what this contributes to the text. Find some online images of the Egyptian and Palestinian desert and compare these to the landscape of Cudgegong area in NSW. What are the similarities and differences? How would the Aussie soldiers have experienced that new place? Investigate some of the descriptions of landscape, sand and thirst in the book. This story begins in 1914. Discuss some of the elements of the rural NSW setting at the beginning of the book. If possible show some images of what it was like then. Discuss the different vernacular and colloquialisms some people used in the bush back then. You could discuss colloquialisms in a present day context in order to relate that to language spoken in the day. Start with the examples below working together to find alternative, more contemporary ways of expressing these ideas. In doing so discuss the pros and cons of the original language as it appears in the book. Allocate a couple of chapters to small groups and invite them to add to the list for a whole-class share. In this next activity, students will examine the sentences in Loyal Creatures to identify which are complex, which are simple and which are sentence fragments. Prior to beginning, teachers may wish to revise the information in the Australian Curriculum on sentence structure. Gleitzman uses a range of sentence structures for effect. Introduce this idea by referring to the blurb on the back of the book. Did I want to volunteer with Daisy? the head with a canvas bucket. After some discussion, allocate different chapters to pairs of students and invite them to identify and examine some of the sentences in Loyal Creatures to indicate which are complex, which are simple and which are sentence fragments. Simple: But it was never in our hands. Complex: We were just loyal creatures too, our heads turned this way and that by politicians and generals and the dark waters in our own souls. Gleitzman is a celebrated writer. How does his use of sentence structure contribute to the ‘readability’ and popularity of this book? What is the impact of the variety of sentence structure? Are the sentences structures used by the author related to the topic of this book? Daisy was a champ. As the planes came at us I was shaking like a windmill. If I’d been a horse, I’d have been bolting, or on my belly with my hooves over my eyes. Not Daisy. Hardly a quiver. I tried to make my breathing like hers, slow and easy. And for the rest of that day, whenever we heard the whine of a plane engine and the flapping of its canvas coming over the desert, we’d stop and breathe together, calm and still, like we were the same creature. In groups of four have the groups discuss these lines from Chapter 11 and plan and rehearse how this scene might be represented. Then invite each group to make a freeze frame including all group members. Once each group is ready take a photo to display to the class. Compare and contrast how the words from the book are portrayed by each group of four. While this is a book of historical fiction, the students will now know from their reading of primary sources like journals and letters from wartime, and also from the author’s note, that the types of events in this book are not very different to those that the men and horses in the Light Horse regiment might have experienced. Revisit some of the findings from research and the initial wonderings about the book and have a short discussion around what the students are now thinking. Ask them to imagine Frank (or any member of the regiment) has been involved in the war for 6 months, and to write a letter to him. If necessary, revise letter-writing format before beginning. In 1915, William Morris Hughes was elected as Prime Minister of Australia. The numbers of men joining the war had decreased and the new Prime Minister was interested in conscription. Hughes took the issue to a referendum which caused heated debate from both those for and against. The referendum was narrowly defeated. Voluntary enlistment continued to fall and Australia could not provide the men needed by Britain. A second referendum was called which was also narrowly defeated. Using what they have learned from Loyal Creatures, ask students to work in groups and try to imagine life in 1915. Writing from that perspective, ask them to suggest arguments for and against conscription at that time in history. Suggest they think about Frank and his attitude to war, Frank’s mother and Frank’s father and what they thought. By 1915, the second year of WWI, recruitment for the war was dropping. A recruitment campaign was developed, and recruitment posters (later to become known as propaganda posters) appeared. These were designed to encourage men and boys to enlist and fight. Some were designed to promote fear or even shame. There are several websites where these can be viewed, one being the South Australian State Records. Select two or three that are suitable for your classroom, particularly ones that appeal to loyalty and courage. In small groups have students examine the images you have selected and some of the resources from the Australian War memorial on the conscription debate. Frank would not have seen these posters as they started to appear after he enlisted. Ask: what were the reasons that made Frank so keen to join the war effort? After some discussion ask each student to ‘be’ Frank and write a statement giving his reasons for joining the war. Suggest they think about it as a persuasive text to his (deceased) mother. If she had been alive, how might he have persuaded her to let him enlist? Prompt students to think about the time, the place and to refer back to the book to check how Frank speaks. Morris Gleitzman was the Children’s Laureate from 2018 to 2019. Read about Morris Gleitzman’s role as Children’s Laureate on his website. In 2015 Loyal Creatures was shortlisted for Book of the Year Older Children and Speech Pathology Australia Book of the Year as well as the CBCA Book of the Year Awards. 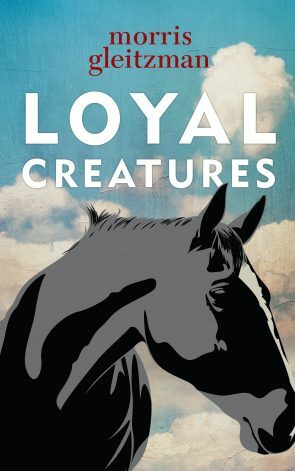 Loyal Creatures was a Notable Book for Older Readers. Listen to an Interview with Morris Gleitzman with a focus on Loyal Creatures. Learn about the stage play related to the book. 2018 marked 100 years since the First World War Armistice. This was acknowledged in towns and cities all over Australia. At the War Memorial in Canberra 62,000 handmade poppies were displayed to honour the 62,000 Australian lives lost in the First World War. The Australian Light Horse Brigade and various related websites. During WWI recruitment posters (later to become known as propaganda posters) appeared. They were designed to encourage men and boys to enlist and fight. Some were designed to promote fear or even shame. There are several websites where these can be viewed one being the South Australian State Records. The State Library of NSW also has a digitised collection. Explore Resources from the Australian War Memorial on the conscription debate. Memorial Boxes: The Memorial Box explores the unique wartime experiences of Aboriginal and Torres Strait Islander people, and their significant contribution to Australia’s defence. Several are available. Personal stories: There are several case studies. Each contains a personal story, as well as suggested activities for research and classroom discussion, and the information relates to the hands-on objects you will find inside your Memorial Box. Australians at war in France and the Middle East. E-Books are available free of charge from the Australian War memorial site on a range of topics related to WW1. LYNDAL CARBERY has been a teacher for over 15 years and has taught in West Africa and the Northern Territory. Currently she is a teacher at Katherine School of the Air. In the six years in that role she has been involved in unit writing for upper Primary and in 2018 has been a project writer, creating multi-age, multi-level, integrated Linked Learning Projects for KSA’s Primary Team. Lyndal has a passion for grammar, writing and The Arts. WENDY BEAN is an education consultant. She regularly works in schools with the aim of supporting positive changes in student outcomes. She is a member of ALEA and and is currently on National Council as well as having an active role on the ALEA Sydney North local council.